3..2..1..blast off as your child is taken on an exciting, star-studded journey of discovery around the milky way! A one of a kind keepsake that will surely fuel your child’s imagination! 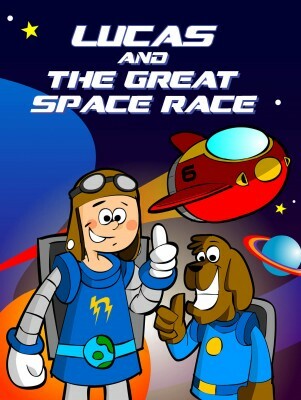 MY GREAT SPACE RACE ADVENTURE is an awesome personalized book that transports your child on an out of this world experience and shows him, in a powerful way, how unique and special he really is! This 24 page storybook is stunningly illustrated by Andre Cui with character sketches by Piaget Martelino and written by internationally published writer Maria Natalia Mercedes Diaz. Each 8 3/8” x 10 3/4” professionally bound hardcover book is personalized throughout the text and illustrations, including the child’s name, home country, and relatives and/or friends. As an added personal touch, this book contains a printed dedication from the sender. This precious keepsake is a perfect gift for boys ages 0-12. (See our girl version as well). To add a blast of fun, your child will also be able to go on an exciting space hunt! The only information required to be able to order this gift is the child's name. All other information provided is optional. Although if provided, it would enhance the uniqueness of each gift created especially for the child.